As we watch the so-called migration crisis unfold, we naturally ask ourselves what’s the sense, what’s the purpose? We are told we need workforce, yet there are millions of unemployed young Europeans; we are told we are paying for the sins of the yesteryear of colonialism, yet drawing people from the Third World, we strip the countries of origin of brains and hands i.e. act as colonialists. We are told these are refugees, yet we must get down to work to integrate them as if refugees, by definition, were not people who plan on returning to their war-torn countries after the conflict is over. We are told the Third-World immigrants are enriching us, yet we observe street riots, crime rate increase, reinforced police units in our streets and a number of East European countries defending themselves from being blessed with this enrichment. We are told the newcomers will integrate, yet we see separate city boroughs, no-go zones, oriental attire on the increase and parallel societies. We are told diversity is our strength, and yet we receive news now and again about ethnic, racial and religious conflicts from regions around the globe which are immersed in diversity. We are told this, we are told that, but none of the advanced arguments add up, and we instinctively feel an approaching disaster. What is really going on? If it is not economy, aid, enrichment, neo-colonialism, then what is it? Why all of a sudden this influx of aliens, why all of a sudden this readiness to accommodate them? Africa or Asia (as any other continent) have been ravaged by wars for centuries, and yet Europe has never ever before experienced the human flood therefrom. What’s going on? Heresies have been present throughout human history all the time. We use the theological term but we mean it in its broadest application possible. Heresies are manifestations of the collective aberration of the mind that catches hold of humans from time to time and spreads like wild fire, like biological or software viruses, with all the attendant phenomena, including their mutations. We do not mean merely Albigensian or Iconoclast followers or many, many others, but also the adherents to the Jacobin and Marxist, Trotskyist and Leninist and, and, and many other follies. For the mutations are countless but the phenomenon in its broadest sense is one: a deviation of the collective human mind. The underlying driving force is a feeling of a calling, being on a mission, in a word Messianic ecstasy which the adherents of a heresy read ideological experience, a sense of occupying high moral ground. All the heresies that have been mutating and spreading, including the present ones and those yet to come, have a common denominator: they (or, to put it better, their proponents, advocates, disciples and fellow travellers) want the betterment of humankind, once and for all, in every corner of the earth. Sometimes this betterment means tearing down images of God, at other times it means the abolition of private property; sometimes it means a replacement of a creed, at other times it means re-educating of the populace; sometimes it means religion, at other times atheism; sometimes a caste-based society, at other times a classless, a raceless society; all and sunder such changes, creeping or violent, aim, as the modern hackneyed phrase goes, at “making the world a better place to live in”. 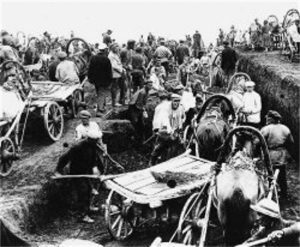 It was not long ago that Europeans were told repeatedly that the liberation of the working class and the peasantry would release such huge productive forces that the resultant progress would bring men and women to the heavenly heights of development. In the name of such prospective happiness of the humanity, civilisations of whatever kind (Russian Orthodox, Chinese Mandarin, French Catholic, American White Anglo-Saxon, and currently Romano-Greco-Christian European) had to be obliterated mercilessly and deleted from the face of the earth. Future paradise warranted any and all steps, be they the killing fields (Kampuchea), concentration camps (Soviet Union), ethnic replacement (the European Union), subverting of the morals (Frankfurt School), cultural revolution (Mao’s China), regicide (England, France, Russia), you name it. It has all been done for the greatest happiness of the largest masses of people. In the twentieth century the manual worker and the peasant was put on the altar and deified. This was coupled with enmity towards nations and tradition. 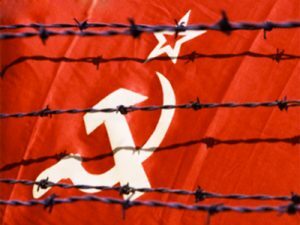 People in communist countries were compelled to worship that idol and bring sacrifices in return for which they were promised – a big pie in the earthly sky after they die… for their grandchildren. (Humanity’s saviours are careful to promise paradise not to the living, but to the yet-to-be-born generations.) It somehow did not work – the working class proved to be incorrigible in their traditional ways, so in the twenty-first century the virus mutated and produced a new idol to be put on the altar: a man of colour. His presence among us and his affirmation, we are told, will release such huge productive forces that we will all benefit from it; his mere presence will enrich us to such an extent that our aged parents and grandparents will have the time of their lives in their old age homes and our grandchildren… well, our adopted grandchildren of colour will live happily ever after, replacing us and our biological grandchildren, which is no difference at all, for we are brethren, a global village, an extended human family. What more do heresies have in common? For one thing, they are irrational and admit of no discussion. And though heresies begin as a rebellion accusing the dominant creed of intolerance, once they are firmly in the saddle, they are not tolerant of rebellions against them (political correctness); and for the other, they work towards the biological demise of their believers: the heretical teachers may call on you not to have offspring because the end of the world is nigh or because the planet is overpopulated; or accept the replacement of your kith and kin because your nation does not deserve to survive and must do penance for the wrongs done. People whose minds have been infested with a virus are controlled by it to such an extent that they accept their predicament with serenity, calmness and joy. That’s the working of religion. 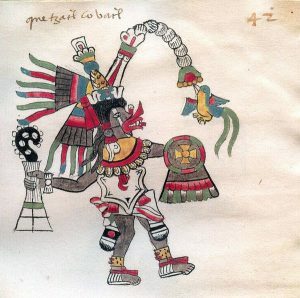 We are all familiar with the Aztec story of Quetzalcoatl (pictured). A bearded, feathered snake-like god promised to come back to his people some time in the future. When the Spaniards set foot on Mexican soil, the Aztec elites recognised in them their god and in their arrival the fulfilment of his promise of old, so the priests told their compatriots to lay down their arms and welcome the newcomers, i.e. they disabled, deactivated, paralysed the immune system of the residents of Tenochtitlan. They could have combated the invaders, but their ideology told them to refrain; they could have spurned the trinkets offered them by the Spaniards, but they chose luxury. When they finally saw through their god, the god turned nasty. Or the other way round. Whichever occurred first, it was too late. Such stories proliferate throughout human history in all latitudes. 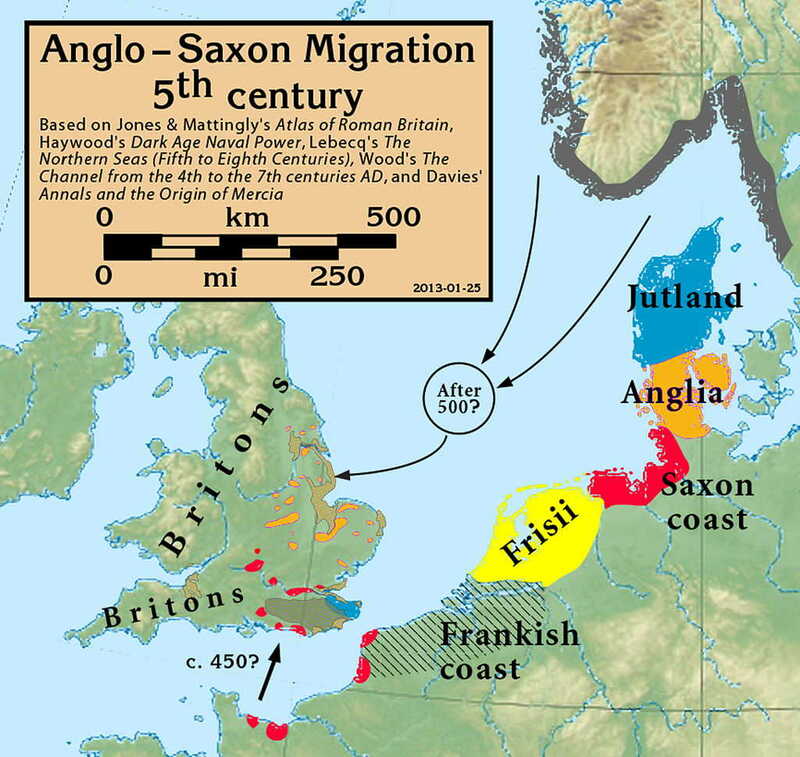 The British Celts used the help of the Angles and Saxons and ended up being dominated and replaced by them; the Romans invited Germanic tribes, used their services and paid them tribute, and ended up being sacked; the Poles invited the Teutonic Knights to defend them against a branch of the Balts, and ended up having their connection to the Baltic Sea cut off by the welcome German warriors; the Eastern Slavs (present-day Ukraine) invited Varangians and ended up under their rule. And so on, and so forth. Spanish Mexico is by far a different political, cultural and social entity than its Aztec predecessor; the Ottoman Empire that replaced Byzantium is not a transformation of, but a transplant on, the old structure, where the Greek language gave way to Turkish, and the Basilica of the Hagia Sofia became the Imperial Mosque; under the influence of the Germanic peoples on the Apennine Peninsula Latin morphed into Italian; Soviet Russia was Russian in language only; the gradual and numerous influx of German settlers cleansed the area between the Elbe and the Oder of the Slavic tribes with only geographical names revealing to a knowledgeable man who the original inhabitants were. Some of the above mentioned peoples and nations disappeared from the historical chronicles after a bitter resistance, some embraced their own demise with an inexplicable mirth, i.e. some were virus controlled, others were not. A man controlled by a virus is a complete opposite of his healthy former self. In the face of a threat, his former self would have put up a fight, but his diseased version invites the destruction of his home and family; his former healthy self would have refrained from taking suicidal steps whereas his virus-controlled (ideology-driven) version embraces his doom with a debilitating smile and condemns his ancestors for acting differently. Once Europeans were proud of enlightening other continents with the blessings of their civilisation, for they shared with the peoples of the earth their medicine, agriculture, technology, arts, literature, education, system of government and law. Today’s Europeans are ashamed of their great grandparents and accuse them of all evil imaginable. What a profound change. An English queen used to be empress of India, which included Pakistan; today a Pakistani is a mayor of the capital of the former British Empire. When the British queen was India’s empress, numerically the English made up a droplet of the population of India and Pakistan combined. Today, when a Pakistani is London’s mayor, the English are a minority in their own capital. Talk about colonisation!